Seth has been a little bit obsessed with the idea of tempeh lately, and I’m not sure why. I kind of struggle with cooking it – maybe I’m not doing it right, or maybe I don’t like it as much as I think I do. Either way, whenever I make tempeh, I’m never as happy with it as I am when I get it at a restaurant. Unless it’s tempeh sloppy joes – I rock those. Anyway, since he was asking for tempeh, I decided to make the Tempeh Orzilla recipe from Isa Does It and the PPK site. Once again, this was one that I’d made the sauce portion of the recipe from before, but not the rest. There is one difference in the recipe from the book to the website and it’s in the tempeh prep. The book doesn’t say to steam it first, which I thought was a little weird, since most recipes using tempeh have you do that first. Rather than second guess it, I followed it as written and didn’t steam. I think the tempeh would have been a little less bitter and a bit softer if I’d steamed it, but it was still really good, so no big deal. The recipe on the site says to steam for 10 minutes before sautéing it. We also didn’t have any anise on hand, so I used the chopped fennel substitution. 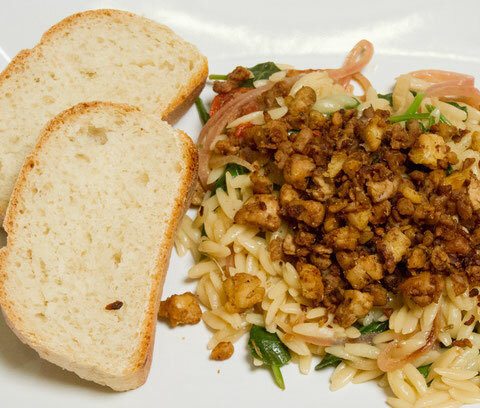 The result is sausage-like crumbles that go on top of the pasta. The rest is really simple and is really just a matter of the making sauce. I cut the sundried tomatoes into smaller pieces rather than leaving them whole, and I ended up adding extra spinach because I think I made too much pasta. We were big fans of this recipe and will make it again. It’s simple, hearty, and delicious and it makes a lot. It says 4 servings, but I think we’ll get more than that out of it. We had some French bread I’d made a couple of weeks ago and kept in the freezer along with a side salad to round out the meal.